Successfully Added Xiaomi Mi Wireless Mouse - Bluetooth 4.0, 2.4G Connectivity, 2x AAA Battery, 1200DPI, Ultra-Sleek And Light Weight to your Shopping Cart. With this wireless mouse from Xiaomi, you’ll always be able to efficiently use your laptop and tablet on the go. Featuring an ultra-sleek and stylish design, this beautiful Bluetooth mouse is highly portable and can be easily carried along wherever you go. Weighing less than 78 grams with its batteries included and featuring a size smaller than 11CM in length, the Xiaomi Mi mouse can be efficiently slipped in your backpack, purse, or laptop bag without causing any inconvenience. Its miniature yet durable design has been crafted out of high-end ABS material and finished off with an aluminum shell – giving it not only a stylish look but also making it extremely tough. No matter where life will take you next – with the Xiaomi wireless mouse you’ll always be able to efficiently use your tablet computer or laptop and immensely increase your overall productivity on the go. Powered by two regular AAA batteries that are easily replaceable, this Bluetooth mouse supports month’s worth of continuous usage time – allowing you to enjoy all its benefits without needing to worry about running out of juice. 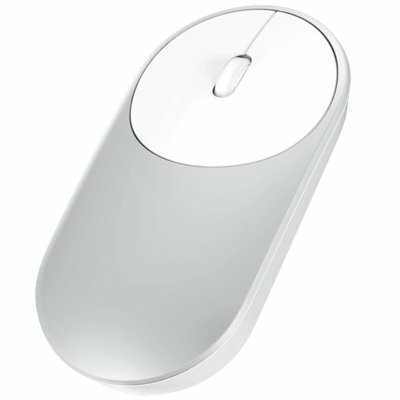 Besides its Bluetooth support, the Xiaomi mouse can also be paired with your laptop, tablet, TV box, or regular desktop computer through the included 2.4G wireless USB stick – truly increasing its overall adaptability as this mouse can literally be synchronized with almost all electronic devices. The Xiaomi Mi mouse comes with a 12 months warranty, brought to you by the leader in electronic devices as well as wholesale electronic gadgets..